In August 955 a battle took place that effectively ended the incursions of steppe nomads into Western Europe. The forces of Otto the Great annihilated a huge army of Hungarian mounted archers in an encounter that is generally known as the battle of Lechfeld, a broad plain near Augsburg in southern Germany. Since even after a defeat these elusive warriors surely could have fled back to the Carpathian Basin to rebuild their strength and resume their raids, the total annihilation of the Hungarian army is mysterious. This book provides the first satisfactory explanation for the decisive nature of Otto's victory. 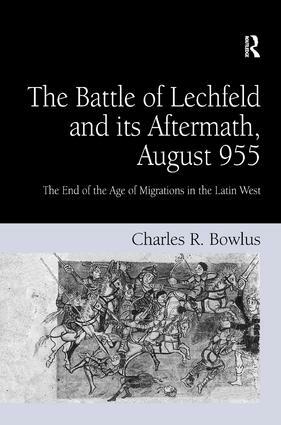 Based on a detailed analysis of all contemporary, and often contradictory, sources, Bowlus provides a step-by-step reconstruction of the battle. This is preceded by chapters analysing the administrative and military reforms in tenth-century Germany, and the strengths and weaknesses of nomadic styles of warfare, in particular their archery, and setting out the historical context in which the battle occurred. A pioneering aspect of his research is the introduction of environmental factors, not only the limits they imposed on the expansion of the nomadic way of life into Europe, but also the impact the local environment had on the outcome of the battle. Contents: Preface; Introduction; Hungarian warfare; The reforms of Henry I in Saxony; Hungarians and the Latin West; The way to the Lechfeld; The way from the Lechfeld; Conclusion: Hungarian defeat - Ottonian Victory; Appendices; Bibliography; Index. Charles R. Bowlus is Emeritus Professor of History at the University of Arkansas at Little Rock, USA.